Bus from Singapore to Kluang is the most preferred and budget choice of transportation. Many people from Kluang are either working or further studying in Singapore because Kluang is not far away from Singapore. These groups of people rely on the bus service to go back to Kluang during off day or weekend. The One Travel is the only operator serving bus from Singapore to Kluang operating with coach brand of Five Stars Express. Five Stars Express is the dominant bus operator in this route by providing quality service and frequent schedules for their passengers. They have up to 16 daily departure times for bus from Singapore to Kluang. The earliest bus service is as early as 7am and the last bus service will leave at night 9:30pm. The estimated duration required for bus from Singapore to Kluang is 2.5 hours, depending on the traffic condition. Please note that clearing customs may take up to 2 to 3 hours during peak season. The bus fare for bus from Singapore to Kluang is charged at a price of SGD 21.50. There are 2 pick-up points in Singapore which are Golden Mile Complex and Boon Lay Shopping Center. The drop-off point in Kluang is in Kluang Bus Terminal. Washroom break will be given upon request from the driver during the journey. Even though there are frequent schedules for bus from Singapore to Kluang, passengers are advised to book their bus ticket in advance especially during peak hour and festival season. 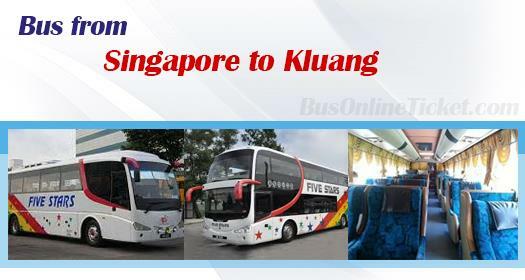 Passengers can book their bus from Singapore to Kluang ticket from BusOnlineTicket.com and receive an instantly confirmation email. In order to travel with complete peace of mind, book your bus ticket now with BusOnlineTicket.com, the safest and most reliable ticketing portal.